Note: This post originally appeared on the Religion in American History blog. According to the new Pew study “America’s Changing Religious Landscape,” 6.9% of respondents identified their religious affiliation or belief as “nothing in particular” and also reported that religion was somewhat or very important to their lives. For a minute, let’s set aside questions about the reliability of the survey, the phrasing of the questions, whether the “nones” exist and/or matter, and why we need to distinguish between Older and Younger Millennials (I’m in the latter camp apparently, and I feel [insert emoji] about that.) For now, let’s think about how these people—a group Pew labeled the “Nothing in particulars (religion important)”—came to their position, or at least how that position became possible. At first, this position struck me as funny. Who could believe deeply and sincerely in nothing in particular? What does a life look like when the belief and practice of nothing in particular is central to it? And perhaps it is funny. But it might also tell us something about the state of “religion” in the United States. In a couple weeks at the Biennial Conference on Religion and American Culture, a panel and audience will consider the question, “What do we mean by ‘religion’ in a time of ‘spirituality,’ ‘lived religion,’ and ‘non-religion’”? The answer I’d give: nothing in particular, and it’s very important. We are all Nothing in particulars (religion important) now. A hospice chaplain cited in A Ministry of Presence summarized the purpose of his job: “We are there to be there” (185). Sullivan explains how, through legal and cultural history, simply “to be there”—not to convert or preach or even to dole out advice—came to be what is required of chaplains. The case that sets the stage for the book is Freedom From Religion Foundation v. Nicholson (2008), wherein the FFRF challenged a VA hospital program that measured individuals’ “spiritual fitness.” As Sullivan points out, seeing spirituality as integral to a person—even at the measurable, material level—is not new. She cites, for example, John Modern’s discussion of phrenologists’ invention/discovery of the faculty of spirituality. And, self-promotionally, I should add that my dissertation will include a chapter on various efforts to determine individuals’ sincerity by examining physical evidence of interior belief. This logic also structures a certain brand of psychology of religion, starting with William James and carrying forward through today. Religion—or maybe “spirituality” is better—is a thing, a real thing, that everyone has. It’s part of your brain. Thus, nothing in particular (religion important) is not an anomaly; it’s a natural stasis. To be very particular (religion important) might be to verge on “fundamentalism” and thus fail to be adequately pluralistic. If you believe nothing in particular but it is not important to you, well, perhaps you need to wake up. Your spiritual needs, like nutritional needs, are there whether you pay attention and act accordingly or not. As Sullivan demonstrates, this type of essentialized spirituality is important because it circumvents the “high wall of separation” of mid-twentieth-century jurisprudence. If spirituality is natural and part of the human, the state ought to help care for it. Chaplains are everywhere now. Sullivan’s book focuses mainly on hospitals, prisons, and the military. But sports teams and corporations have them too. There is such a thing as a tech chaplain. Innate, quasi-medicalized spirituality is a work-around in the face of stringent forms of modern disestablishment, but it’s not only that. It allows spirituality and spiritual practices to be utilized and commoditized, which further proves their importance. If everyone has spirituality then they should exercise it, tap its potential. Yoga and meditation will improve your life. So will having a “higher purpose.” Proselytization might not. So, the professional work that chaplains do, especially in governmental, self-consciously secular spaces, usually cannot be too particular. A memorable anecdote from Sullivan’s book is about a Pentecostal minister named Franklin Baz who in 1978 was dismissed from his job as a chaplain at an Illinois VA hospital (156; see the case here). As evidence of his effectiveness, Baz cited in his quarterly report the twenty-nine “decisions for Christ” he had facilitated. He was not a nothing in particular. His dismissal was upheld in court and again on appeal. 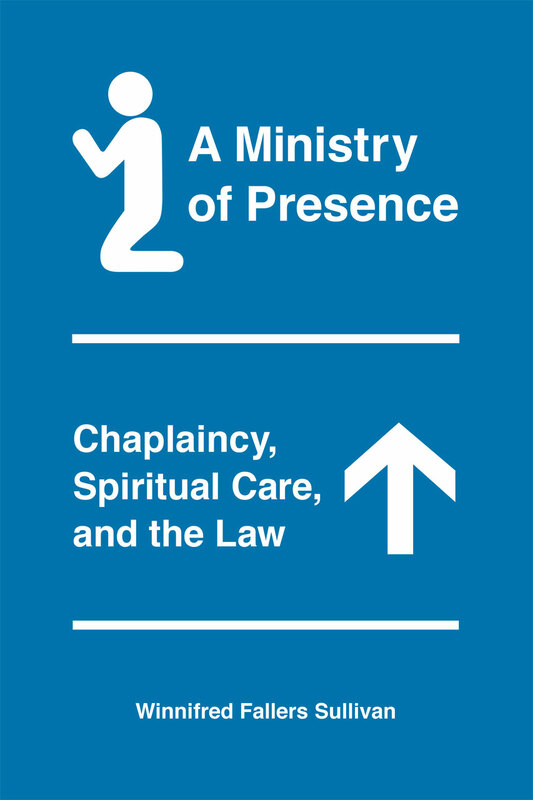 I read A Ministry of Presence in the context of a class I co-taught last fall with Mike Graziano on religion and American law (for more on that course see here and here.) Before this book we read Hugh Urban’s The Church of Scientology. One of the things that stuck out to me in Urban’s book was that L. Ron Hubbard’s initial attempts to play up, as he put it, “the religion angle” (i.e., self-consciously rebranding their organization as a religion) was not in order to receive tax exempt status. Later, of course, that would be the point, and it led to a decades-long feud between the Church and the IRS, culminating with the Church winning the status (although paying their back taxes) in 1993. At first, though, in the early 1950s, the religion angle was about the FDA, with whom Scientologists were in hot water for using their e-meters to do what was legally the realm of medicine and, thus, subject to credentialing, certification, and so on. If an auditing session were a religious exercise, these restrictions and standards would not apply. In the recent case in Encinitas, California a court determined that yoga is in fact religious but nevertheless legal, since “a reasonable student” wouldn’t perceive it as evincing a “message of eastern or anti-western religion.” So, indeed it is religious, but it is not, to use the language of nineteenth-century school debates, sectarian. It’s nothing in particular (but important.) In the same way, the chaplain must be religious only in the most general, widely applicable sense. It is not a coincidence that these three examples (“spiritual fitness,” e-meters, and yoga) all have to do with bodily health, which I suspect is due to their supposed pre-discursiveness and universality. “Religion” in America is in the odd position of being at once eminently special and necessarily ineffectual. It is protected, privileged, and even encouraged by the state. Nevertheless, it is relegated to a place from which it cannot make medical claims or be too particular or proselytizing. This, I think, is one of the central problems illustrated by recent Religious Freedom Restoration Acts and similar executive orders and the reactions to them. Debates about “religious freedom” today are about individuals’ rights (quite broadly considered) versus the public good, which might be harmed by the exercise of individual rights. (Sincere anti-vaccination beliefs cause basically the same problem.) Broad definitions of religion (not to mention “person”) ensure expansive protections. However, with that broadness often comes vagueness. What these new acts and orders attempt to do, in part, is to protect a wide range of sincere beliefs and include very particular or sectarian beliefs in that expansive definition, even when those particularities cause them to do discriminatory things that, according to critics, are detrimental to civil society and the public good. The operative understanding of religion, for some jurists, psychologists, counselors, chaplains, and apparently a growing number of other Americans favors a “hopeful,” “moral,” and forgiving style of religion that benefits individuals’ mental, physical, and spiritual health. 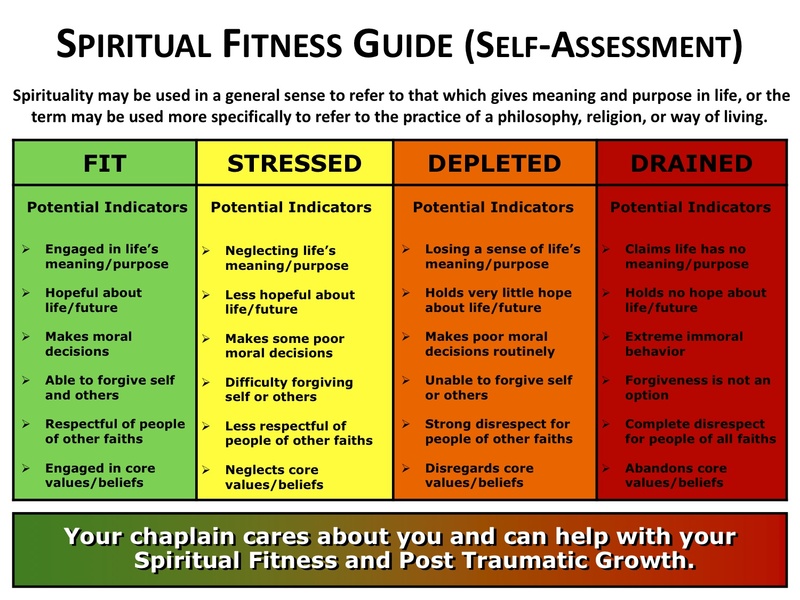 As seen in the chart above, the spiritually fit among us are “engaged in life’s meaning/purpose.” But this religion cannot be taken so seriously—or, rather, misunderstood or improperly lived—that it precludes pluralistic respect for other “faiths.” Indeed, the religion of the spiritually fit sounds like Nothing in particular (religion important.) Of this type of religion, the type the chaplain practices when he or she administers “spiritual care,” Sullivan writes, “It is religion stripped to the basics. Religion naturalized. Religion without code, cult, or community. Religion without metaphysics. It is religion for a state of uncertainty” (174). Thus the chaplains simply are “there to be there.” American religion, supporting some secularization theses and upending others, hangs around. This entry was posted in Charles McCrary, Politics and Religion, Religion and Society, Religion and Theory, Theory and Method and tagged A Ministry of Presence, Franklin Baz, Hugh Urban, John Modern, Mike Graziano, Religious Freedom Restoration Act, The Church of Scientology, William James, Winnifred Sullivan. Bookmark the permalink.